Kesterite type semiconductor compounds are attractive materials for absorbers in thin film photovoltaics. Especially Cu2ZnSn(S,Se)4 (CZTSSe) has achieved power conversion efficiencies of up to 12.6 % . CZTSSe consists mainly of earth-abundant and non-toxic elements and thus promises a cost-efficient large scale production of solar cells. Kesterites most commonly crystallize in the tetragonal space group I, but when going to the nano-regime the crystallites seem to behave differently. 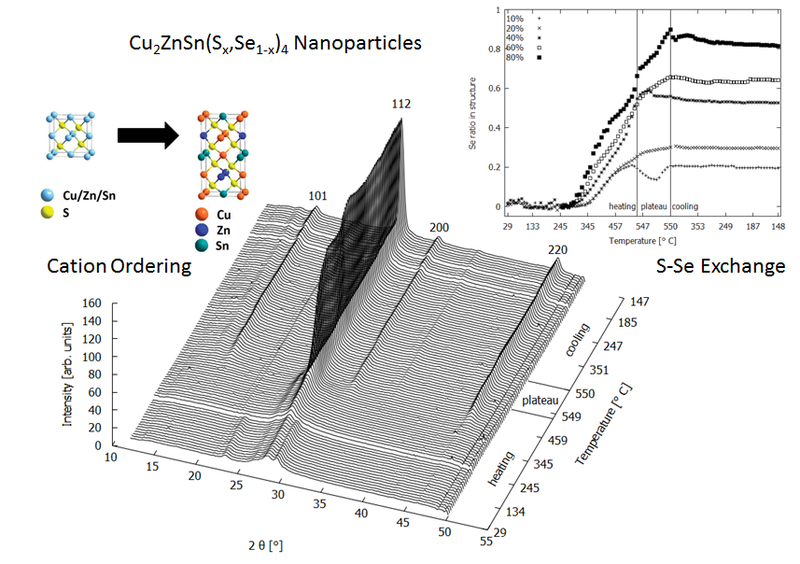 The Nanoparticles of CZTSSe, which are used for example in inks for printable photovoltaics, have a lower degree of ordering in their crystal structure. A statistical distribution of the cations on the respective site leads to a cubic structure. In-Situ powder X-ray diffraction at temperatures of up to 550 °C reveals that the tetragonal order in the structure of the nanoparticles can be established by heating. In the presence of elemental selenium, the temperature of the ordering process is lower. Selenium most probably acts as a fluxing agent facilitating ordering and recrystallization. Annealing CZTS with elemental selenium also causes an exchange reaction between sulfur in the structure and gaseous selenium. The characteristics of this reaction strongly depend on the selenium supply. For more information see . A recent review of kesterite solar cells can be found in . W. Wang, M.T. Winkler, O. Gunawan, T. Gokmen, T.K. Todorov, Y. Zhu, D.B. Mitzi, Device Characteristics of CZTSSe Thin-Film Solar Cells with 12.6% Efficiency, Adv. Energy Mater. (2013). doi:10.1002/aenm.201301465. M.H. 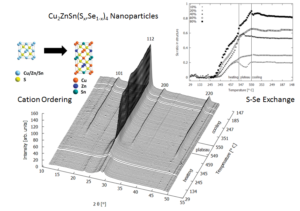 Sayed, M. Brandl, C. Chory, I. Hammer-Riedel, J. Parisi, L. Gütay, R. Hock, In-situ XRD investigation of re-crystallization and selenization of CZTS nanoparticles, J. Alloys Compd. 686 (2016) 24–29. doi:10.1016/j.jallcom.2016.05.313. X. Liu, Y. Feng, H. Cui, F. Liu, X. Hao, G. Conibeer, D.B. Mitzi, M. Green, The current status and future prospects of kesterite solar cells: a brief review, Prog. Photovoltaics Res. Appl. 24 (2016) 879–898. doi:10.1002/pip.2741.